When the realities of the new Pro14 conference format became clear not everyone was happy and there were always going to be discrepancies that were easy to find. In my writeup of our win in Belfast I pointed out that should Leinster's Conference B turn into a scrap for first place between ourselves and Scarlets, it's a shame that both of our meetings happen slap bang in the middle of the Six Nations when neither of us will have full squads. And the anomalies don't end there - take our return to Glasgow tonight. The Warriors being in the other conference means this is the only time we play them in the regular season, and we drew the short straw in that we must face them away from home right before the November internationals, while the Scarlets get them in Llanelli in April when their internationals will be available once more. You might think I'm pointing this out so I can produce it as an excuse should things go wrong for us...in actual fact it's the opposite. This league certainly didn't need a complex conference format to produce inequalities in the schedule such as the ones I have outlined. In previous campaigns, with 22 rounds spread out from the beginning of September to the end of May, playing certain teams at certain times of the year was always significant, so IMO we shouldn't harp on too much about it, at least, er, after this preview, ahem. Anyway....back to tonight. Curious match to predict, this. Even though both venue and combatants were replicated not two weeks ago, you might as well be talking about a cricket match in Sri Lanka if you want to draw comparisons. 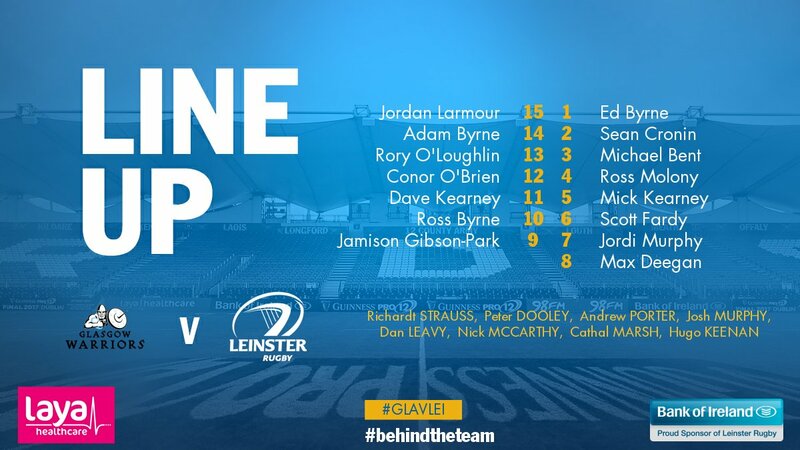 Leinster's lineup bears much more resemblance to that which I saw defeat Cardiff at Donnybrook in the BandI Cup a couple of weeks ago, with a handful of top level experience scattered among a group of developing prospects. Most eye-catching among our test-capped bunch is Scott Fardy. I hate to say I told you so...ah who am I kidding, I love it...but when I saw he was coming to Leinster as a lock I had a feeling it wouldn't be long before we saw him play 6 and for this match in particular we could be needing his Super Rugby experience to help counter the considerable breakdown threat of Callum Gibbins, who will be keen to impress after disappointing two weeks ago, plus he's the Warriors' captain tonight. Next for singling out is Jordan Larmour - after announcing himself to the wider Sky audience last weekend he has another chance to push for a longer stint in the senior side tonight. He definitely has explosive pace but he'll need to impress in all aspects to muscle into a pecking order which is soon to include an extra Kiwi. Speaking of Kiwis, this match is another chance for Jamison Gibson-Park to stem to growing swell of doubters among Leinster fans. He's getting towards that zone where you find yourself trying too hard to impress, if he's not there already, and that can often make matters worse. For me, the winning of this match comes from the centre pairings. We have had an extremely difficult time putting out the same 12/13 combo two weeks running in this young season, and even when we do, we tend to lose one in the opening quarter. Tonight we give a debut to Conor O'Brien, who is indeed a great prospect but in many ways this is a tricky baptism for him, if for no other reason that alongside Rory O'Loughlin he must face Glasgow's Johnson and Grigg who have teamed up several times in their 100% start to the season. So partly because of the centre matchup, partly because of our young side overall, partly because of an assumption Glasgow have extra motivation to win because of what happened in Europe, and partly because I'm superstitious about predicting a Leinster triumph every single week, I'm going to agree with the bookies on a home win, but rather than the 3pts they say I reckon we'll just squeak a losing bonus. If you're not travelling to Glasgow, make preparations for watching on d'telly as it's not on the regular channels. I always smile to myself when people offer advice online that gores something like "Just go into 'other channels' and you can get BBC Alba", as if absolutely everyone has a Sky box. If you do, then you can do that - if not, then TG4 plan to livestream the match at the link below so if you can cast that to your tellybox you won't know the difference. Failing all of that, regular TG4 are offering deferred coverage as well at 9:30.